British service industries are known worldwide for their high standards and quality. Export of British services is often more challenging than that of goods, yet with China embarking on an economic structural transformation, there will be huge potential for British firms in these sectors for years to come. 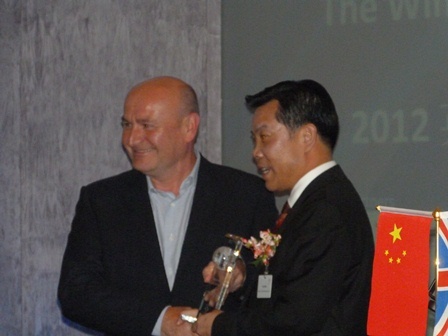 Priestmangoode Ltd, a London based leading industrial design company, has won The Windsor Award 2012 for Export of British Services to China. Mr Paul Priestman, Director of Priestmangoode received the award from Mr Qiu Jibao, Vice-Chairman of the China Chamber of International Commerce – partner of the UK-China Business Conference organised by BCC LinkToChina. The Windsor Award recognises the success of the best of British services that are exporting to the Chinese market. Priestmangoode is the UK’s leading design consultancy, working in aviation, transport, product, environment, branding and packaging design for a roster of significant brands across the globe. In 2011, the studio opened its first overseas office in Qingdao, China. It is the first British product and transport design company to have set up an office there. The office supports on-going work that the studio has been carrying out in China for the last four years. The company has a growing client base in the country, including a long-term contract with a major Chinese rolling stock manufacturer. Since the successful launch of its Qingdao office in 2011, it has established a reputation for world class design in China, participating in events such as the Wuxi exhibition and Beijing Design Week. BCC LinkToChina and its partners are pleased to have been able to support the company at various stages of the company’s recent work in China and it is delighted that the company has been the chosen by the award panel to receive this award. It was announced on Monday 17th September at an award reception at Copthorne Hotel Slough-Windsor, which was attended by 170 British and Chinese delegates, many of whom were delegates for the UK-China Business Conference. This entry was posted in British Export, UK China Business Conference, Windsor Award and tagged china chamber of international commerce, Industrial design, Priestmangoode, qingdao china, Windsor Award for Export of British Services. Bookmark the permalink.